Please Help to Keep This Website Operational! A/C crashed in a deep ravine 3 mi NW of Wheeler AAF at approx 1710 hrs after engine failed during a routine maintenance flight. Mid-air collision while conducting a nighttime evaluation of a Marine Cobra squadron at the Marine Air Ground Combat Center at Twenty-nine Palms. 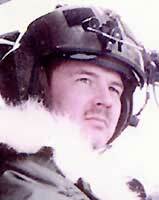 Pilot was an Army Liaison to the Marine Air Combat School in Mesa Arizona. 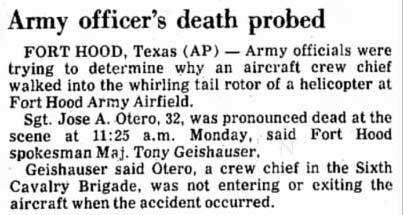 A/C crashed while conducting Aerial Gunnery practice when the engine failed due to a clogged engine inlet. The engine inlet filter bypass failed. A/C plunged to the ground about 15 degrees nose low on left side and caught fire at approx 1600 hrs 17 mi NW of main post on Ft Irwin. Midair collision between two AH-1 Cobra helicopters during an NVG training mission. 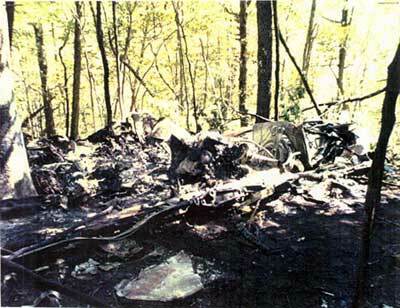 Collision occurred during an NVG tactical formation training flight at 150' AGL, A/C descended in a nose-low attitude with flames and sparks coming from the xsmn area, rotors barely turning struck the ground tail first on the downslope of a ridge, and was engulfed in a postcrash fire. A/C crashed on Dona Ana range while checking range land on a flight from Ft Bliss. A/C was Chalk #3 in flight of four when A/C began to fishtail and appeared to attempt running landing, front tip of left skid contacted the ground and came to rest inverted at approx. 1330 hours near Indian Springs while en route to a Red Flag exercise in the desert at Nellis AFB due to T/R bearing failure. A/C was performing high-speed dives and failed to complete a recovery at less than 400' AGL and crashed in a swampy area about 10 mi S of Geneva. 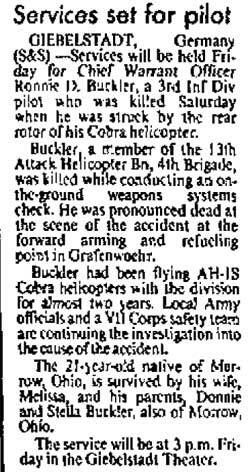 Killed when he was struck by the T/R blade while conducting an on-the-ground weapons systems check at Grafenwoehr. A/C crashed N of Woodlawn (Training Area 8) after a tree strike during a routine training mission at Ft Campbell at approx 1600 hrs. A/C was on the third circuit of a racetrack pattern simulating firing support for a troop insertion. Crew cut the pattern short in a nose-low left bank at low altitude, then leveled and assumed a nose-high attitude to stop the descent. A/C struck several trees with the M/R and T/R and began to climb to about 100' AGL. T/R drive shaft was severed and A/C descended vertically in a right spin, struck the ground nose and right-side low and came to rest on right side. *Keenan died of injuries while in the emergency room. Mid-air with CH-47D #85-24325 on Ft Stewart during a training mission. Both acft were flying in opposite directions during low-level NVG flight. 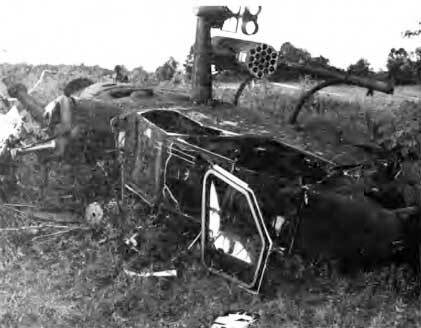 M/R blade of the CH-47 struck the forward cabin area and M/R system of the AH-1, causing in-flight breakup of both acft. 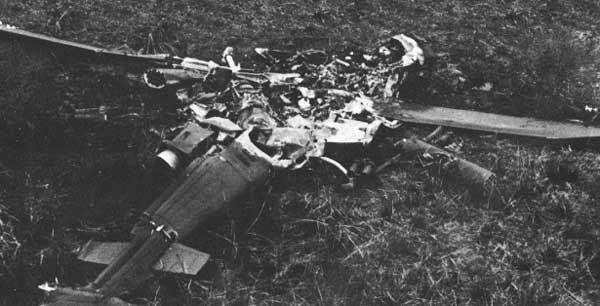 A/C crashed and burst into flames NE of Aschaffenburg due to weather while flying manuevers 'Certain Sentinel 86' from Grafenwoehr to Hanau. 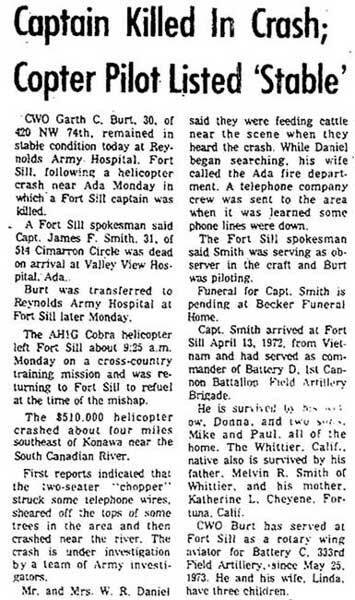 A/C was lead in flight of two elected to deviate from planned route along a valley and inadvertently entered IMC, pilot began VHIRP when he became disoriented and lost control. A/C hit a hilltop with a 7 deg upslope. On initial impact, M/R blade flexed down, striking the ground on the right front of the A/C and the T/B, before the mast snapped. Fuselage bounced into the air and came to rest about 120' from initial point of impact. A/C was in a flight of four OH-58s and two AH-1s flying contour level at approx 120' AGL and 80 KIAS enroute to a field site during Reforger 86. The flight, with the four OH-58s in the lead, made a right turn from a heading of 310 deg to 015 deg. 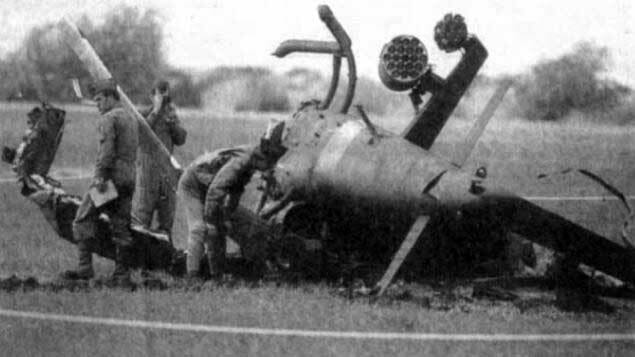 The mishap OH-58, in position four, had turned to 015 degrees and was flying straight and level when the Cobra, in position five, overtook the OH-58 on the right side. M/R blades of the OH-58 struck and penetrated the AH-1's left engine cowlings, severing the main fuel and oil lines and the engine mounts. A/C immediately caught fire, continued straight ahead in a rapid descent, hit two trees, struck the ground, rolled over and burned. CP & CIV extracted the pilot who died a few days later of crash injuries. A/C crashed shortly after takeoff and burned in the Chatahoochee Forest on a training flight at approx 0820 hours with the US Army's Ranger School. CCAD analysis indicated engine failure due to first-stage power turbine failure. A/C crashed in the Sahara 30 miles W of Cairo during Bright Star military exercise. Pilot was giving a demo flight to an Egyptian pilot, making diving manuevers and pulling out close to ground, misjudged clearance and hit a sand dune left side low, rebounded in air, spun to the right, M/R blades flexed and severed T/B and crashed inverted. Pilot was killed when the back of his head impacted the shoulder harness guide on the back of the seat. A/C crashed during a night training mission under NVG just south of Finthen AAF while on GCA. Cause of crash was determined to be Kaman blade separation. Spar separated from honeycomb section of the blade causing the blade to cut off the T/B. A/C was on approach to LZ Runkle on the west side of Ft Rucker at approx 1000 hours while on a acft parts development test flight. A/C rolled inverted while on long final, hit two pecan trees then rolled into front of barn/shed. Cause of the crash was swash plate bearing failure due to a combination of bad lubrication and K747 rotor blades that caused greater than expected forces on the pitch links downward to the swash plate. A/C was RTB from Paul Quinn College in Waco where it was used as a static display for the college's homecoming activities. A/C was flying 100' AGL and 100-120 KIAS trying to maintain VFR at night in deteriorating wx conditions, following IH-35 when it hit the top two strands of a transmission line crossing the highway, lost control and crashed 780m from point of wire strike about 5 mi N of Salado at approx 2000 hours. A/C was undergoing a maintenance operational check to adjust voltage regulator. RPM was increased to 6000 with the application of some left pedal, as RPM was being beeped up to 6600, A/C began to turn left, rotating three complete revolutions and came to rest about 15' from orginal parking spot. *ME stationed near voltage regulator access panel was struck by T/B twice and died approx 2 hrs later of injuries. A/C crashed and burned at approx 1140 hours on the shoreline of the Patuxent River in Calvert County while performing test pilot training. M/R separated due to mast bumping causing blade to enter cockpit killing backseat pilot instantly. IP parachuted to safety. A/C from Ft Carson crashed into a grassy field NE of the Air Force Academy at 1420 hrs. CP noticed engine speed was fluctuating, pilot took over and initiated a power-on landing, A/C landed hard in open area with approx 30 knots forward airspeed. A/C slid forward about 50' and went through a wire fence, flexing M/R blades hit fence, and xmsn torn from its rear mounts, shifted forward causing one M/R blade to hit the forward cockpit killing the pilot. A/C crashed while IP was giving a check ride on Ft Hood. IP initiated a simulated forced landing when pilot stated that engine quit. IP took controls and made a slight turn to the right to land in an area covered by scrub oak and dense undergrowth. 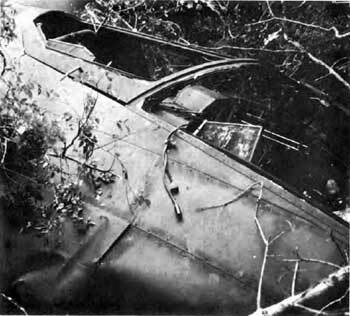 A/C hit the trees in a level attitude with little or no fwd airspeed and came to rest leaning to the left about 60 deg. IP sustained fatal injuries when his torso flexed forward and downward far enough to allow his face to hit the top of the telescopic sight unit. A/C was on maintenance test flight and began rolling left to right in angles exceeding 45 deg. Pilot was unable to control rolls but felt he had partial cyclic control and crashed in open, marshy area about 1 mi from Fort McAllister. Pilot misinterpreted the A/C actions as being caused by main xsmn mount failure instead of an in-flight SCAS malfunction. 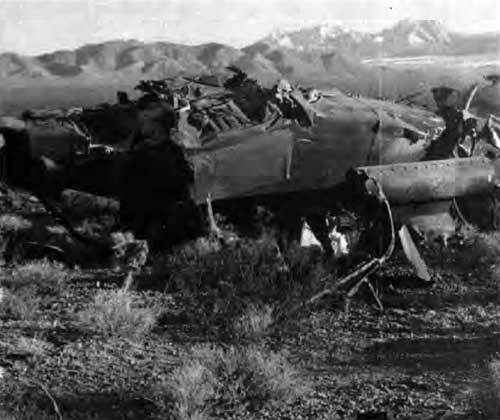 A/C was in a chalk #2 flight of six when it crashed and exploded near Garden City returning from Gallant Eagle exercise at Ft Irwin. Crash was caused by a failure of the white blade P/C link which broke in flight at 6,000'. A resulting severe one-to-one vibration caused the T/B to separate just forward of the stabilizer. Shortly thereafter, the entire M/R and attached transmission separated from airframe mounts and departed vertically. CE walked into T/R blade during maintenance operational check of voltage regulator at Hood AAF at 1125 hrs. 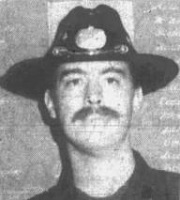 Witnesses saw CE rush toward the rear of A/C in what was suspected to be an attempt to complete his tasks as quickly as possible and get back inside out the cold, damp weather. A/C was on an area orientation flight and were in formation when a M/R pitch change link broke, A/C began to roll to right and then to left at angles of about 30 deg while also yawing (occurring 2-3 times in rapid succession). A/C then rolled right past 90 deg, rotor system unloaded, mast bumping occurred, mast snapped and a blade struck the front cockpit. Camp Stanley airfield named in honor of CW3 Cochran. A/C crashed and exploded at 1000 hours on Route 238 in Captico community during a familiarization flight after a M/R blade failed and sliced through the cockpit which was attributed to "mast bumping". A/C crashed and burned in the woods near Hunter AAF at 2100 hours while returning from a routine training flight from Ft Stewart. Initial cause was engine failure, however pilot applied pitch too early during autorotation causing M/R RPM to bleed off at a height of 150' AGL, causing A/C to descend vertically into the ground. A/C completed mission and returned to parking area for shutdown. Armament team began servicing A/C during shutdown when team member ran into the T/R while performing his duties. A/C from Camp Stanton cruised into ground near Tongduchon, 9 miles N of Seoul at 120 KTS during VMC after DMZ/TAC zone flight for new in-country pilot (Flight Surgeon) orientation. A/C hit the ground at greater than 30 G's. Suspect hydraulic failure and control lock-up??? A/C yawed as SP called "caution light". A/C hit several large trees and came to rest on left side on the Mattheson aerial gunnery range at approx 1130 hrs during Cobra transition training at Ft Rucker. CP died 18JUN79 of injuries sustained in accident. 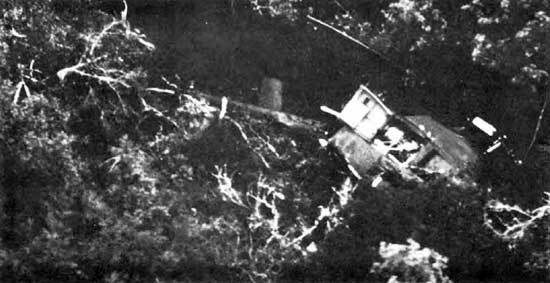 A/C was on a maintenance test flight at East Pass 3 mi E of Camp Stanton AAF (R224) when M/R separated from mast, fuselage spiraled to the right, nose low and exploded on impact. T/R and 90 deg gearbox were found 312' from main wreckage and M/R assy was found about 1800' from main wreckage. Teardown analysis of components revealed no conclusive evidence of defect or malfunction which would have caused to any type of failure with resultant mast bumping. A/C crashed after hitting telephone lines approx. 4 miles SE of Konawa near the North Canadian River while on a cross-country training flight. 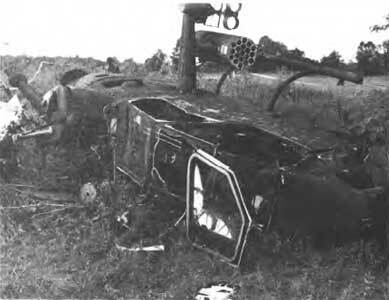 A/C crashed due to wire strike during a "Night Owl" exercise on the Hunter-Liggett Military Reservation near King City and were flying with the first generation prototype NVGs. A/C crashed on the night gunnery range at Ft Stewart. A/C was trail in flight of three when it crashed near Marlow on the Grady-Stephens county line while on a cross-country training flight. Crash was due to M/R blade spar failure. A/C based from Ft Hood crashed shortly after dusk just across the Texas border east of Vado, NM during exercise Brave Shield VI due to wire strike. A/C struck two 5/8" powerlines at 35' AGL and 130 KIAS. T/R assy and vertical fin separated and A/C disintegrated after impact. A/C crashed and burst into flames while on a training mission from Ft Carson, 8 mi SE of the Arapahoe County Airport. A/C was flying at approx 300' AGL and was observed to be making a steep turn, pulled up sharply, stalled and crashed. A/C crashed into trees near Catfish Lake after tail rotor failure at Ft Bragg. 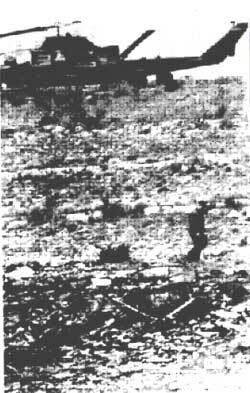 A/C impacted in the range area of Ft Campbell at approx 0800 hrs during gunnery practice which was attributed to target fixation, with the pilot bearing down on the target and "placing the aircraft in an attitude, altitude, and airspeed from which recovery to controlled flight was not possible prior to ground impact. A/C crashed on helicopter gunnery range at Ft Stewart during a training mission. A/C crashed 4 mi SW of Hunter AAF while on a training mission due to T/R failure. Rotated clockwise at 200' and hit trees. A/C crashed into trees during low level auto. approx. 10 min from Hunter AAF. A/C crashed on the armament firing range at Ft Hood during a routine test flight. A/C crashed and burned in a field during routine training mission approx 1 mi from Hunter AAF. Cause of crash was determined to be the design of a small door that fell off during takeoff hit the T/R. A/C crashed in marsh lands surrounding the Ogeechee River near Savannah during flight test of new Cobra.